British Cycling Level 2 coach - National Standards (bikeability) Instructor - First Aid - Child Protection - DBS verified. 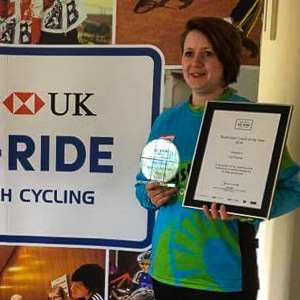 With 15 years experience in the Sports Development and Coaching field Liz Foster has been blown away by the recent boom in cycling, not least because of the positive impact it has had on young people. With her finger on the pulse, KJCC formed at just the right time to satisfy the demand created from the successes at the 2012 Tour de France and Olympics/Paralympics. Liz comments she has yet to see a sport that brings young people together like that of cycling. KJCC has such a wide range of young people taking part weekly all with a common passion. From individual riding to team pursuits the communication, team work and camaraderie is second to none. See also www.lizfostersport.co.uk. Coach Matt Foote has been involved with the Club since 2012, when he started to bring his son Michael down to ride on Saturday mornings. As well as being a British Cycling Level 2 coach, Matt has also gained the Level 2 Cyclo-Cross coaching award and will be running CX specific training and racing throughout the year, alongside regular cycling sessions. 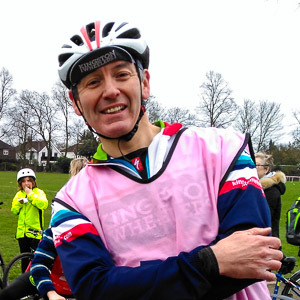 Matt is a member of Kingston Wheelers, and enjoys cycling of all varieties, the muddier the better! Matt is also a fan of Harlequins rugby, often seen at home matches with Michael, and usually with a Quins water bottle on his bike. Geof joined the club along with his son James and soon started volunteering. Already having a passion for bikes Geof went on to complete his BC Level 2. Mountain biking is Geof's favourite part of cycle club and despite having no mountains at the Hawker Centre Geof hasn't let that stop him completing his MTB specific award, building ramps, ditches and bridges to challenge the riders. In 2018, Geof qualified as a Level 2 Road and Time Trial Coach and in 2019 signed up for his level 3. Coaches Cameron, Lucy and Ruhi have all completed their BC Level 1. The three started at the club at the age of 11/12 before joining our Young Volunteer programme, linked to BC. We are exceptionally proud of them and look forward to them coming back each summer when University has stopped.